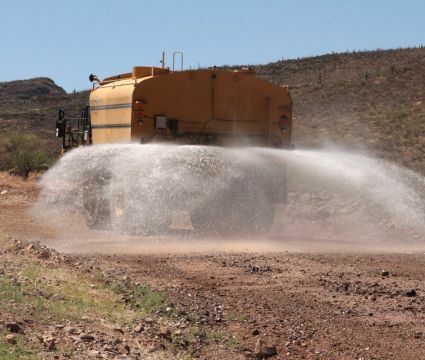 Water trucks provide the means for wetting down dusty surfaces at road construction projects. Caterpillar®, the world’s most trusted heavy equipment manufacturer for nearly a century, offers an impressive line of water trucks and wagons that combine a large storage capacity with ease of operation for fast and efficient application. Cat® watering machines also deliver the legendary reliability and performance that every company requires to keep their projects on schedule and minimize unproductive downtime. Call us today at (317) 803-2526 for more info on water truck rentals. Looking for smaller water truck rentals? Visit MacAllister Rentals for on-highway water trucks. Is your Indiana company looking to add a water truck or wagon on a temporary basis? MacAllister Machinery can deliver the ideal solution. As the region’s exclusive Cat equipment dealer since 1945, we can provide a high-quality water truck rental at a competitive rate. You will get the right machine for your applications and one that fits your budget. You will also avoid having to make a significant capital expenditure or a long-term financial commitment. Our water truck rental inventory consists of late-model, low-hour vehicles that won’t let you down when you need them the most. Our rental fleet undergoes timely preventive maintenance and a rigorous inspection process to ensure it remains in peak operating condition. We also make it easy to rent a water truck or wagon — we can even deliver it directly to your job site or arrange for you to pick it up at one of our convenient locations throughout Indiana. And you will never have to worry about mechanical issues keeping you from meeting your deadlines. We have a team of well-trained and experienced service technicians and a fleet of fully equipped vehicles that are ready to provide 24/7/365 field service whenever you need it. When Should You Consider a Water Truck Rental? If you only need a water truck during certain times of the year, a water truck rental can make better financial sense than buying — we can provide you with a truck for a day, week, month or longer. Renting also presents you with a fast, temporary option for replacing a vehicle that’s undergoing repairs or bolstering your fleet for a short-term project. And many companies turn to renting if they want to try out a machine they’re thinking of purchasing before making a financial commitment. 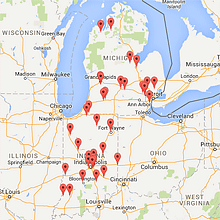 MacAllister Machinery, has a more than 70-year legacy of providing the best heavy equipment in the region. We serve companies in a wide range of industries, from construction and forestry to mining and agriculture. And with our reputation for delivering exceptional customer service, you can rent from us with total confidence. Browse our heavy rental product guide to view our current water truck rental selection and other equipment offerings. And feel free to contact us for additional product and pricing information.